Our line of vinyl wrap film and vinyl sheets in carbon fiber, Rtintï¿½ head and tail light tint, wood grain vinyl films, camo wraps and sticker bomb films are engineered to customize and even protect the interior and exterior surfaces of your car. Although designed for motor vehicles, these vinyl wraps can be applied to just about any hard, non-porous surface. 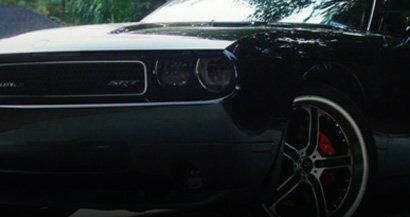 DIY customers, professional automotive restylers and vinyl film wrappers use these films to create amazing custom cars. Now with easy to follow video install instructions, you can personalize your car, truck, SUV or motorcycle in a snap. 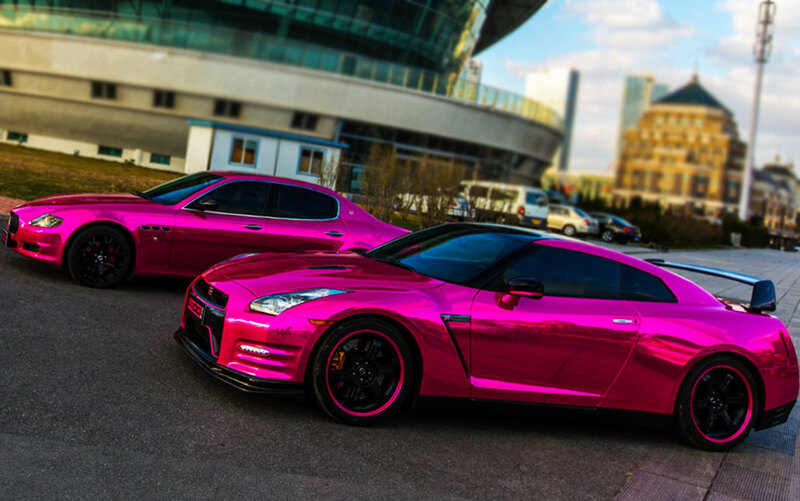 Rwrapsï¿½ carbon fiber vinyl films are the most popular series we offer. Designed to be applied to the inside of your vehicle for a custom dashboard application or even used to wrap your entire car in carbon fiber, they feature a 3D textured and embossed surface, and are available in 12, 24 and 60-inch widths ï¿½ this carbon fiber vinyl film is at the cutting edge of restyling technology. Did you know that 3M Di-Noc films are only rated for one year outdoor use? 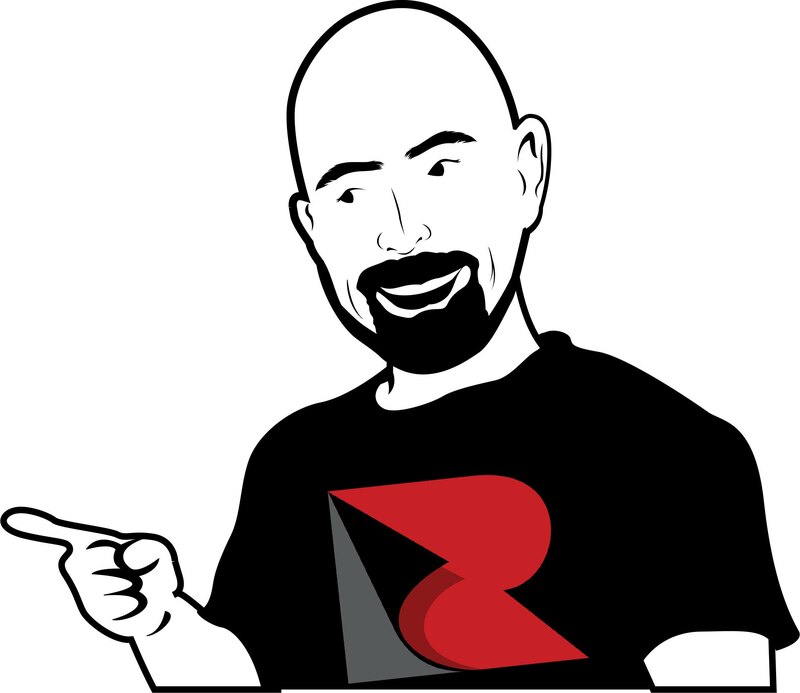 Why spend your time and money on a temporary solution when Rvinyl's carbon fiber vinyl sheets will last a lifetime and at a fraction of the cost of other films. Looking to wrap your hood, trunk roof or just about any part of your car, truck or SUV? Check out our video series featuring an installation preview of a 2011 Honda Civic having its hood wrapped. There are a ton of things you can wrap and when compared with painting and the cost and hassle are substantially less. Whichever carbon fiber film you choose 3D with textured finish or glossy 4D carbon fiber wraps you can get a uniquely realistic look that will be the envy of your friends and rivals. 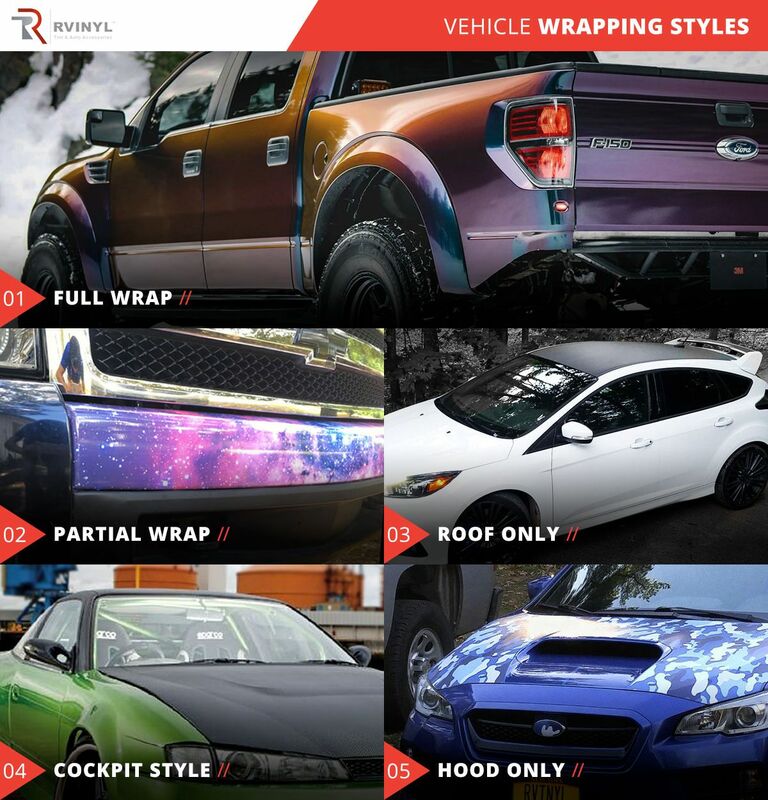 Professional restylers agree, Rwrapsï¿½ carbon fiber films are an industry leader. Rwrapsï¿½ wood vinyl wrap films are the leader in simulated wood finishes. Originally designed for classic car restoration, this is our most popular series for professional and automotive enthusiasts looking to customize their vehicle inside and out with a wood trim look it is also commonly used in architectural and home-furnishing applications. Available in textured finishes as well as high gloss applications, this film series has the genuine look you need to complete your project and keep it under budget. Due to the special manufactuiring techniques needed to product this embossed woodgrain film, we offer our wood wraps in a maximum 24-inch width and without air-release channels in the adhesives. 3Mï¿½'s 1080 Series wraps are made for wrapping and there's no question that their bold colors and exotic finishes will help you stand out in any crowd. With more than 80 finishes to choose from you can find the exact look you want. Take your pick of from shade-shifting Flip films, flaked Gloss or Matte Metallic wraps, Brushed or Carbon Fibers with grains that you can feel. Best of all, when you buy 3Mï¿½ you're not just purchasing a vinyl wrap, you're buying years of research and technology as well. The 3Mï¿½ brand promises quality, reliability, service and warranty ï¿½ things you just can't get anywhere else. Supreme Wrapping 900 Series films give you a full range of finish options and an exciting palette of colors. With an almost dizzying number of wrap hues to choose from you can bve sure to find just the look you want. Choose from shade-shifting ColorFlow films, smooth Satin, flaked Metallic, Brushed or Carbon Fibers with grains that you can feel and that look so real that you can't tell they're film once installed. Best of all, when you buy Avery Dennison&reg; you're not just purchasing a vinyl wrap, you're buying years of research and technology as well. ORAFOL and its ORACALï¿½ brand of adhesive vinyl films are known throughout the world as being manufacturers and purveyors of an almost unheard number and kinds of vinyl films. That's why you know they'll deliver when it comes to quality, durability and performanceï¿½in fact, even their slogan is Engineered to Perform Betterï¿½! With 104 colors to choose from in the 970RA Premium Wrapping Cast film portfolio you can rest assured knowing that you'll always be able to find just the right color for your life. So, whether you're looking for a high Gloss, Metallic, Matte, Matte Metallic or even an eye-catching Shift Effect film, you're sure to find it here. We also carry ORACALï¿½'s full line of 975 Structure Cast Wrapping films too with one-of-a-kind finishes like Honeycmb, Emulsion and Crocodile so be sure to check those out if you're looking for vinyl wraps with a three dimensional texture you can feel. If you're looking for craft and sign vinyl that have been designed especially for use in electronic plotter cutters like Silhouettes and Cricut machines, look no further, because we've got a full range of ORACAL®, Avery Dennison®, 3M™ and Rwrapsï¿½ films too. At Rvinyl, craft and sign vinyl may not be in our blood but it's definitely in our name. That's why we are proud to carry one of the largest selections of craft vinyl for all your scrapbook vinyl and vinyl crafting needs. As a result, not only do we sell the same quality craft vinyl that Provo Craft sells for their Cricut vinyl, we also offer a number of other premium vinyl films that you won't find anywhere else like Avery™ SC950 and 3M™ 180mC films. So, not only do we bring you a full line of ORACALï¿½, Averyï¿½, 3Mï¿½ and Rwrapsï¿½ craft, sign and wrap vinyl but we've cut out the fancy Cricut vinyl packaging and distribution system to bring the same high-quality Cricut vinyl to you for just pennies on the dollar. The Rvinyl team had a brush with greatness the other day when Good Morning America stopped by to pick up a roll of our Gloss Atomic Teal to wrap Kelsea Ballerini's guitar for her performance of "Unapologetically." If you are looking to improve your car's appearance, you have two main options: a new paint job or a vinyl wrap. Both have their advantages and disadvantages, but a vinyl wrap is often more cost effective, faster and more durable than that custom paint job. We'll lay out everything you need to know about the world of automotive vinyl film, and by the end, you should have a clear picture of what to expect and what to keep in mind as you make your final decision. Vinyl has emerged as a favorite material for car enthusiasts who wish to customize the look of their vehicle inside and out. Vinyl is durable, flexible and easy to work with, and there are as many different color and finish options as the vinyl film manufacturers can dream up. When properly applied, vinyl film can produce a finished vehicle that looks every bit as good as a quality paint job, while protecting the car's value in the process. Applying vinyl film to the outside of your car is known as wrapping, and it provides two main benefits. The first is protection for your car's painted surfaces, and the second is the ability to work with colors and finishes that car manufacturers would never be able to offer. Metallic, matte, carbon fiber and even chrome finish options can be combined with any color on the spectrum, and you have complete control over how much of your car you cover with it. Vinyl film is easy to care for as well. It requires just soap and water to clean it when it's dirty. Additionally, because the vinyl itself is the protective coating, there is no need to apply clear coat or wax. It is also quite resilient, but if a vinyl panel does sustain damage, that piece of film can simply be removed and replaced much more quickly and cheaply than you could ever fix a paint job. Applying a vinyl wrap to your car is also less expensive and less labor-intensive than a full paint job. A seasoned professional can apply a high-quality vinyl wrap in about a day, with a bit of prep work beforehand. Once the job is done, there is no drying time required, so you'll be able to drive your car home right away. So what are your options for wrapping your car? Do you have to commit to wrapping the whole vehicle from bumper to bumper? Of course not. You can focus on individual panels to protect against specific dangers or to achieve a particular look. The vinyl film is applied one panel at a time, so you have complete control over how much of your car is covered. If you want absolute protection for your car's painted surfaces, you can cover every body panel with a full wrap. This would prevent damage all the way around. You can also decide on a unique color scheme or finish to give your car a more distinctive look. A matte finish is a popular option for sportier cars, but carbon fiber and metallic finishes can be eye-catching as well. You can also expand your options and explore complex designs with digitally printed vinyl (more on that later). Perhaps you are only concerned with protecting your car's hood and front bumper from road debris, or you are working on a limited budget, and a full wrap is out of the question at the moment. In either case, a clear vinyl wrap for your car's front end can keep your car's paint protected for a fraction of the cost. Contrast is essential in good design, and some automakers apply this principle to great effect. Using a contrasting color for the roof creates a striking visual look that helps to break up the boring sea of gray and black cars. If your car's manufacturer didn't offer this option, however, you'll have to do it yourself. Luckily, vinyl car wraps make this quite easy to do. White and black are the two most common options for a contrasting roof color, but your options are endless. You could even use vinyl to create a custom design for the roof of your car. Another option for a contrasting color combination is to include the entire canopy in one color, which would include the pillars around your car's windows. This would allow you to carry your accent color more fully throughout the entire design. The two-toned "cockpit style" paint job is becoming more common in the world of supercars, both thanks to the proliferation of carbon fiber body panels and a larger design trend toward visual contrast. If you are modifying your car to boost performance and you want to make a visual change to go along with it, you could apply a carbon fiber-patterned vinyl wrap to your car's hood. Real carbon fiber hoods are a common weight-saving measure for race cars, but you can get that sporty look without paying through the nose for an actual carbon fiber hood. Or maybe you long for the days of the Pontiac Trans Am, and you want to bring hood designs back into style. Whatever your imagination, you can get it printed on a vinyl wrap and apply it to your hood. Why Should You Wrap Your Car? Applying a vinyl wrap to your car can be a means of protecting your investment, but it can also be an excellent way to improve the visual appearance of your vehicle. Applying a protective vinyl layer to your vehicle's painted surfaces will help maintain its resale value and keep your car's paint job in good condition. Road debris and UV rays in sunlight can harm your carâ€™s paint and accelerate the aging process. By wrapping your car with vinyl, you are combating both of these threats, and both your car and its next owner will thank you for that. If one of your vinyl panels is damaged, you can simply replace it without worrying about the rest of the car. Vinyl doesn't fade over time, so you won't have to worry about mismatched body panels. A paint job provides no such convenience. If your paint job needs a repair or a refresh, you are committed to repainting the entire car, which will cost you a considerable amount of time and money. As an added benefit, a vinyl wrap will instantly make your car look like it rolled out of the showroom. Regardless of the condition of your car's current paint job, a vinyl wrap will make your car look brand new. Depending on your style, it could even make it look better than new. Since the demise of the infamous Chrysler PT Cruiser, we can't think of a single car that can be ordered straight from the factory with a flame accent paint job. If you want to create a whole new look, either with a crazy color, a different finish, or a unique design, a custom vinyl wrap is going to be much easier to apply than a custom paint job would be. Furthermore, it will be much more cost-effective, easier to maintain, easier to repair and much easier to resell. That custom design you loved so much would undoubtedly limit the resale market. With a vinyl wrap, however, you can remove it, restore the car to its original appearance, and tap into a much larger potential group of customers. Applying vinyl automotive wraps isn't a black art, but it does require a certain set of skills and a tremendous amount of patience. Professional shops have the tools and expertise necessary, and for most people, the quality of their work will be worth the money you paid for the job. Additionally, any reputable shop will warranty their product and guarantee the quality of their work. The extra peace of mind will also help you enjoy your car that much more. However, if you are the type of person who prefers the DIY approach, installing your own vinyl wrap can be quite the rewarding task. You'll need to procure a heat gun, some taping supplies and a good utility knife. A friend to provide a helping hand will also make things go much more smoothly. Thankfully, vinyl film is inexpensive enough that you donâ€™t have to let a few mistakes torpedo the entire project. Learn from your mistake, unroll another sheet, and keep on moving. When tackling a vinyl wrap project at home, we have a few words of advice. The first is to wash your car, and when you think it is clean enough, wash it again. You want to provide as clean a surface as possible for the adhesive on the vinyl film to make good contact. This means your car's paint surface should be free of any residue or wax. This also means you should remove any rust spots or imperfections on your car's body panels. Vinyl film is intended to adhere to the contours of your car faithfully, so any imperfections, bumps or dents in the panels are going to show through the vinyl film as well. Vinyl is designed to cover up an ugly car, not a banged-up car. The choice between digitally printed vinyl and pre-cured vinyl is a pretty easy choice to make because your desired outcome will make the decision for you. Digitally printed vinyl comes in a base white and then runs through a large-format printer to apply your design. If you have your heart set on a pattern or design of any kind, this will be the way to go. Finding a shop with a suitable printer and a talented artist to create the design might require a bit of legwork, but the finished product will be worth the hassle. Pre-cured vinyl is the typical product everyone pictures in their mind. Pre-cured vinyl comes in all of the various finish types, but your only design option is one solid color. This color is set in the curing process, which involves the mixing of the base material to create uniformity. If you are looking for a solid color, you will save a lot of time and money by using a pre-cured vinyl film. There is no need whatsoever to buy digitally printed vinyl film and then apply a uniform pattern or color to it. Calendared vinyl is created by extruding a malleable form of the vinyl compound through a series of rollers, which flatten out the product to reach the desired thickness. The finished vinyl can be rather thick and inflexible, though advancements in production techniques and equipment have improved the process considerably. It also retains a memory, which means if it is stored in flat sheets, it will always tend to flatten out, no matter what surface it covers. Cast vinyl is created by producing a liquid form of the vinyl product and spreading it out in very thin sheets before curing it, which creates a more flexible finished product. The casting process is also newer than the calendared process, which means cast vinyl is the more durable of the two products. However, because of the additional materials and production resources necessary to produce it, cast vinyl will be more expensive than calendared vinyl. In this case, though, the extra cost is justified in the superior finished product. Because calendared vinyl is more rigid than cast, it is not a good choice for most panels on a passenger car. Modern curves and especially side mirrors just aren't suited for a calendared vinyl product. If you are hoping to apply a wrap to a panel fan or something in the way of a commercial vehicle, calendared vinyl could be an option. But for a car, a cast vinyl product will be much easier to work with and provide a much better wrap job. Durability also leans in favor of cast vinyl, which boasts a lifespan of five to twelve years, depending on the quality of the product. In comparison, calendared vinyl will have a lifespan of between one and seven years. Car vinyl doesn't have the same longevity requirements that permanent signage would, but you should still look for a product that you can expect to last a few years longer than you'll own the car. Now that you understand all of the relevant factors in the decision-making process, you are ready to start shopping for that perfect vehicle wrap. With so many options to choose from, you still have a long road ahead of you. Do you want to return your car to its shiny showroom glory, or do you want to go for a more unique, custom look? Are you good with your hands and looking for a weekend project you can show off around town, or do you prefer to leave it up to the professionals? And lastly, are you ready to fall in love with your car all over again? No matter where your vinyl wrap dreams ultimately lead you, take a look at our selection of high-quality vinyl vehicle wraps above - all backed up by our excellent warranties and customer service. At Rvinyl we pride ourselves on offering the widest selection of colors, sizes and styles of carbon fiber vinyl wraps anywhere. Choose from our high-gloss, ultra-realistic 4D Carbon Fiber films or our textured, semi-gloss 3D Carbon Fiber vinyl. Buy by the foot in 12, 24 or 60 inch widths so you never end up with more than you need and don't forget to submit your review and photos for our $20 Cash Back Rebate. Exactly what we were looking for and the color selection was awesome. Made my helmet easier to see in traffic. The vinyl worked great for wrapping my motorcycle helmet! It added a splash of style and made my helmet easier to see in traffic. I ordered bronze 3M vinyl for a customer's project. I could not find this color available at my normal sign supply stores. I was able to order just the amount I needed for the project. The price was a bit higher than I would normally pay, but like I said, I got a specific amount. My only complaint would be about the shipping time, but it was acceptable. Thank you! Bought vinyl to customize our Camaro Fifty, very pleased with the fast shipping, quality and ability to cut with my Cricut. Definately hope to be getting more soon and will spread the word. The product is amazing and I highly recommend it! I ordered the 3M wrap film series 1080 in Shadow Black to use as a protector for the top of my laptop. Just as I suspected, this vinyl is durable, easy to position, and an excellent product to work with. It provides a great level of protection against scratches and abrasive materials on my computer and it looks amazing! I have received so many compliments on the look and feel of the vinyl. Although I did not use it as a car wrap like it was intended, the product is amazing and I highly recommend it! The 3m vinyl is great!